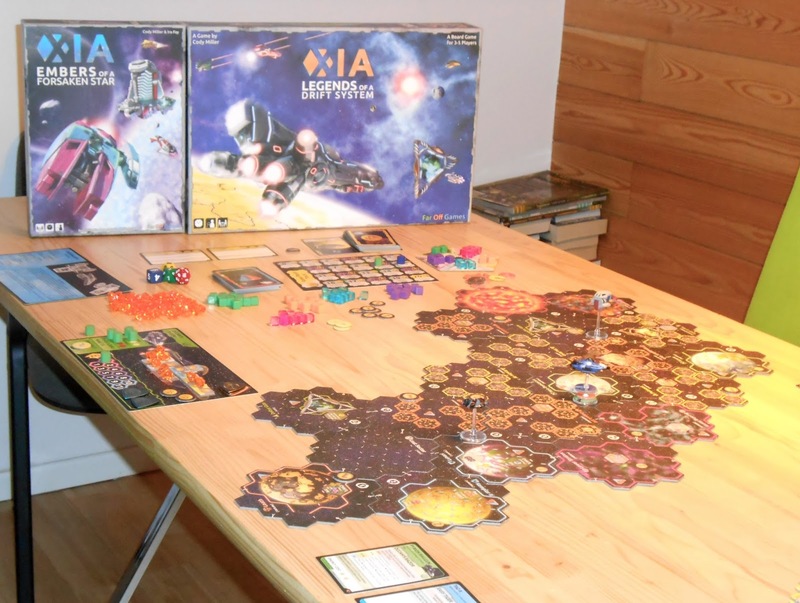 This game was on Kickstarter few years ago, big box with lots of components and painted ships for 80$ - great value. But, it become almost impossible to find afterwards – copies on e-bay reached price 3 times more than original. 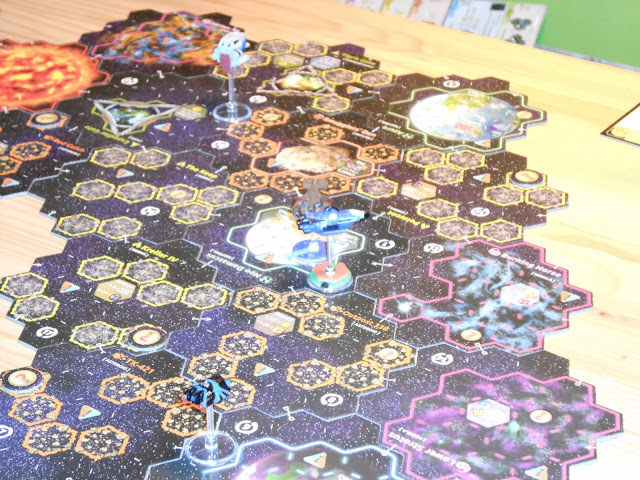 Last year, game came back to Kickstarter with expansion XIA: Embers of a Forsaken Star. This time I did not miss the kickstrter. Last week, copy of Xia landed on my table. Easiest way to describe game is, probably, - “Elite” on the table top. You can be merchant, miner, pirate, you can upgrade your ship or buy new, take missions, explore….. First player to reach certain amount of fame is a winner. Basic resource in the game is energy of your ship. You can do actions as long as you have energy to pay for them. When you run out of actions/energy you turn is over, and play pass to next player. Game use dices to resolve some actions – D6, D8, D12 and D20. Today my son and I get to the table and played our first game of XIA. 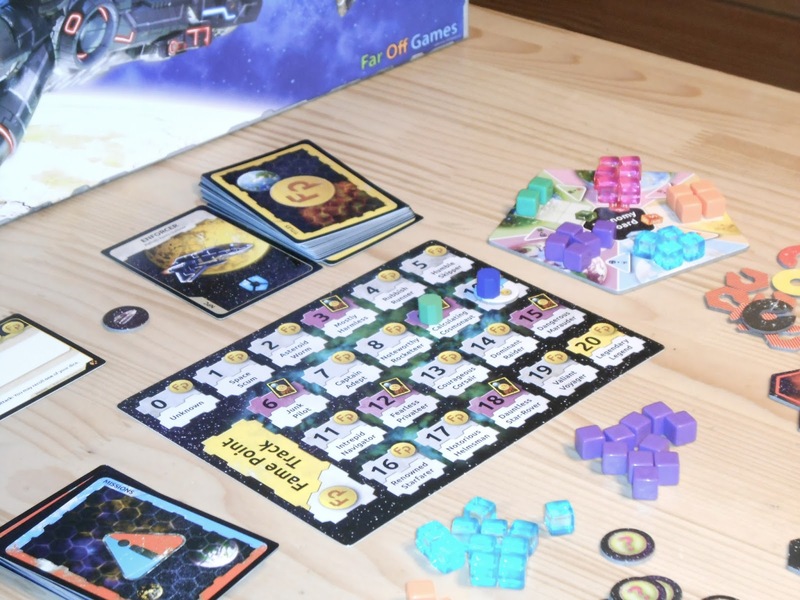 We played basic game but added economy wheel and ships from expansion. 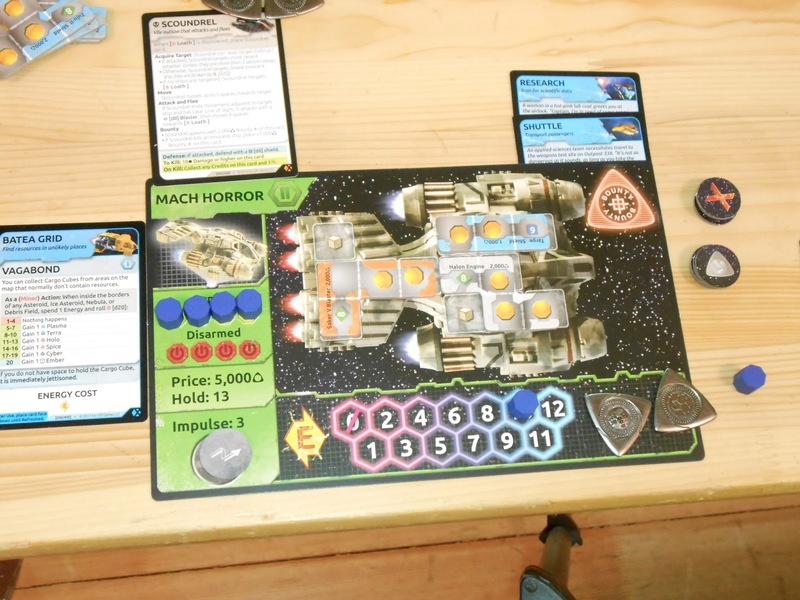 First impression – game is fantastic, and the one we played had real cliff hanger at the end. My son started strongly – get lucky with first mission and quickly obtained 2nd tear ship. Afterwards he got mission to destroy me, with my meager ship. 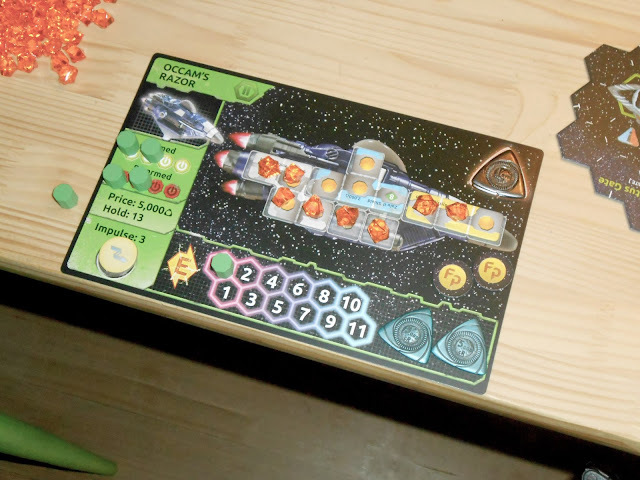 Out of energy (stranded is a term in a game) I tried to escape through debris field, but after third debris field my luck run out and I died (every time you enter debris field you cast D20; 4-20 you are OK, 1-3 you die). After I respawn, game become more peaceful, we both were trying to do our missions. I slowly catch up with him on fame board and even reached 9 first (we played until 10 points of fame). I was on the planet and my son approached with his ship to finalize his last mission and collect his final fame point. My last chance was to destroy him. I fired my blasters, even ram my ship in to his, but he was still alive. My turn ended and my last chance was special ability of my ship to interrupt his turn and shoot once. The chance was slim because he still had three shields. I rolled D20 and got 20 – automatic fame point and victory (you receive one fame point for luck if you roll 20 on D20). This kind of game, I suppose, favorites a specific build for specific task – that kind of ship, with that kind of upgrade for that role (pirate, merchant…). But I enjoyed so much just to wonder around, doing little bit of exploring, some trading and mining and even fighting at the end. Such a blast!